Snapchatters, get your cats ready for their glam shots. 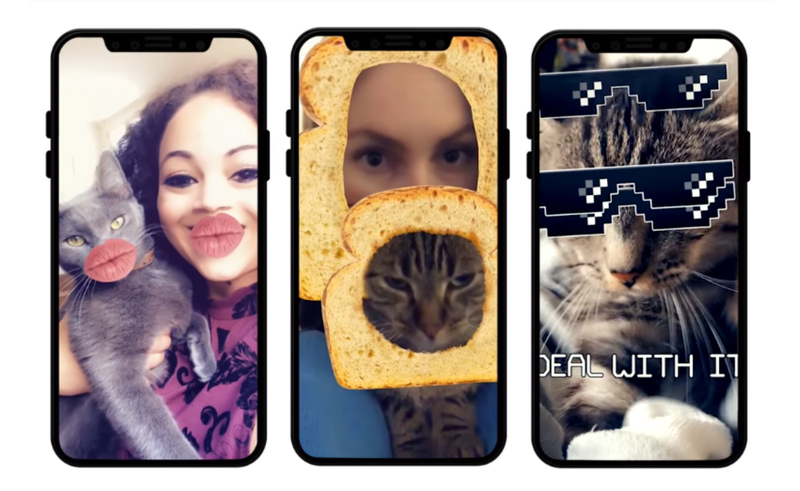 The messaging app has added cat-tracking Lenses so users’ furry BFFs can appear right alongside them outfitted with slices of bread (an homage to the popular ‘cat breading‘ meme), the ‘deal with it’ meme, googly eyes, a unicorn horn, and more — including, of course, a Lens that reveals cats in their true forms: as tiny, red-winged devils. Snapchat revealed the new Lenses on YouTube this morning. The social media app added in a capability to recognize pets (as well as other objects and scenes like concerts, beaches, sports, and food) last year, and many people have made use of that ability to use the app’s human-intended Lenses on their animals — often with hilarious results — but these Lenses are the first designed specifically for animals. And earlier this year, Snapchat focused on custom Lenses, charging users $10 for each custom augmented reality Lens they created in its Lens Studio tool. In June, Snapchat rolled that tool out further, entreating musicians to partner with the app and make their own custom promotional Lenses.